“Healing Pools” by Brian Knep consists of two interactive floor projections with patterns that change in response to visitors. 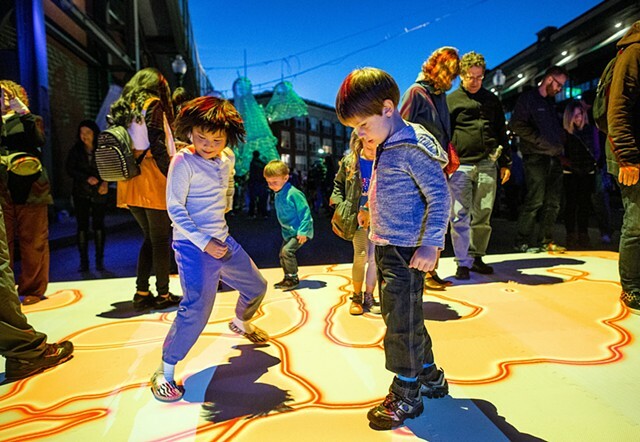 For Illuminus, the pieces will be projected directly onto the surface of Lansdowne Street from above. Knep uses custom algorithms to create a glowing pool of organic patterns on the ground. Left alone, the patterns slowly pulsate and shift over the course of the evening. When a person walks across the piece the patterns tear apart and rebuild themselves, but never exactly as before. The change is similar to a scar left behind when a wound heals. Thus the pool holds a history, or memory, of all the interactions that have occurred since the piece began.